Notice the wax paper scraps, this is what is left from the emergency feeding last Jan. Had I not done this the hive would have starved. It needed syrup but should build up enough to divide. Note the bees eating the pollen patties on the edges of the patty. A pail of syrup saved the hive from starving. March is here and it is almost time to start our spring management. What we do now will help the bees build up for a possible divide in May. Around mid March the bees will be given a pail of 1:1 sugar water or High Fructose Corn Syrup. Feeding syrup will stimulate the hive simulating a nectar flow. Don't over-feed. We want to keep the bees alive not plug up the brood nest with syrup. The queen should start increasing her egg output. With the increased amount of brood in the hive the remainder of pollen stored from last year will be depleted quickly. Adding a patty of pollen substitute is now crucial for brood development. A 1 lb patty is about the right size to be given to an over-wintered colony. Pollen patties are made by mixing pollen substitute with sugar syrup. Patties are mixed to a consisting of cookie dough and let stand overnight. The next day it should have thickened. Mix more syrup for that cookie dough consistency. Remember the pollen substitute must be mixed with syrup or the bees won't take it. Put a large spoonful on a sheet of wax paper. Fold the wax paper in half like a sandwich. The wax paper stays on the patty to keep it moist. If you don't want to make a pollen patty commercially made pollen patties can be purchased, some have natural pollen mixed in with them. Commercially made patties will mold less than a patty made with a sugar-water mixture. Put the patty on the top bars where the bees are clustered, almost always it will be just under the inner cover. Tear open the patty a little bit exposing the pollen sub so the bees can get to it. The bees will consume the patty and chew up the wax paper. Give the bees another patty 10 - 14 days later or if it is moldy or hard and dried out. This should get our bees to warmer temperatures of April. 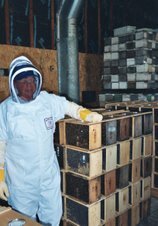 Clean out and close up any dead hives. This will save any unused honey for new packages. Order package bees now if we need to fill any empty hives. Assemble and paint any new wooden ware.